Some of you might remember that I was given the book Quiet: The Power of Introverts in a World That Can't Stop Talking to read as part of the personal Facebook Challenge I put up, allowing six people to choose six books for me to read during this calendar year. Quiet was given to me by Amber M. I was excited to read this one after reading several positive reviews of it over the past year or so. Most memorable to me was Barabara's review and I was delighted (and grateful) to be "assigned" a book that I had on my personal wishlist. (Thank you, Amber!) Let's just ignore the fact that it took me until November to read it, shall we? Quiet : The Power of Introverts in a World That Can't Stop Talking was and is intriguing for me to read because I am an introvert. I don't know that I would have labeled myself as that when I was younger but I came to a very definite realization that I have introvert tendencies as I proceeded into adulthood. While I may seem wordy online, I'm actually really, really quiet in person unless or until I get to know a person quite well. I have to be very comfortable with the people and the surroundings to want to talk much outloud. I am always alert and am paying attention to the conversation and activities around me, but I might not necessarily say anything about them at the time. More recently I've found that people I know generally at church and in town are surprised to hear that I'm an introvert because my husband and I host so many gatherings in our home. It's true that I love practicing hospitality. It is also true that I am very calculating in the way that I go about doing so. For example, I prefer large crowds to small ones because I find that I am not required to do as much talking and entertaining if there are more people present. I would rather host one hundred people in my home all at once than five, unless I know those five really well. Also, after having any type of event (large or small) in my home, I usually spend the entire day afterwards resting quietly in my pajamas. I need to feel comfortable and be still after spending time with others. It is only in this way that I find myself able to recharge. I have also learned to pace myself when we have family gatherings. I have learned that I have to plan "time out" for myself during the gathering. This is not because I don't like my family but because I start to break down if I don't have a little time away and alone to be quiet. I begin to feel tense and stressed and even physically ill if I'm around people for consecutive days on end without a little time alone to regroup and breathe a bit on my own. Overnight guests are an absolute joy to me, but I quit apologizing for not coming out of my bedroom until 9 a.m. or so because I need that morning quiet time to rev up for the rest of the day's activities or else I will collapse before the visit is over and that's no good. Quiet is an interesting book because the main purpose of it is to convince extroverts that introverts are just as valuable as they are. There is no "better" or "worse" way to be, but both types of people bring something to the table that is worth considering. I don't really need a book to tell me that my introvert tendencies are valuable. I feel very confident and secure in my quiet, regardless of whether or not it makes much sense to others. I have a lot of extrovert friends and I enjoy them a great deal - (I usually find them highly entertaining) - but I don't wish to be like them nor do I demand that they be like me. 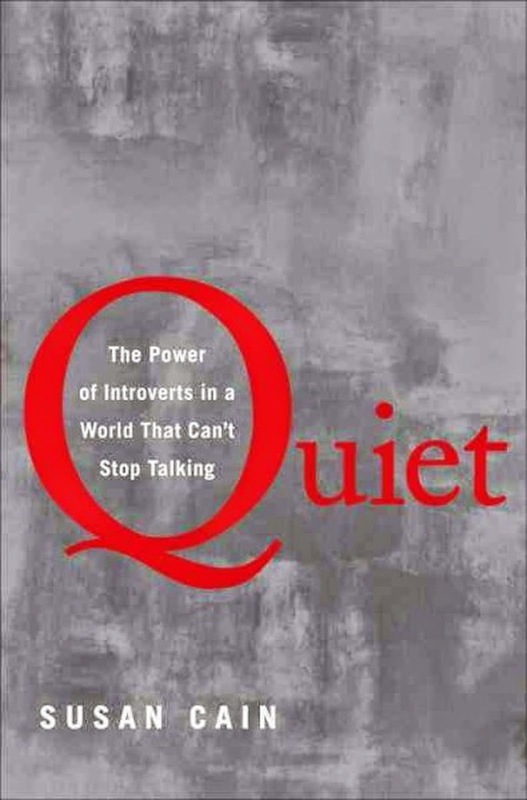 I found this book interesting because it enlightened me to the fact that extroverts do need to see the value of the introvert and I found Cain's arguments as to the benefits of including introverts into society in a manner that suits them to be most intriguing. "Because there's a bias against introverts. Our schools, workplaces, and religious institutions are designed for extroverts, and many introverts believe that there is something wrong with them and that they should try to "pass" as extroverts. This bias leads to a colossal waste of talent, energy, and ultimately, happiness." Throughout the entire book, Cain makes the argument that American culture, in particular, demands that each of this country's citizens be loud, outgoing, exciting extroverts. We are all made to feel as if we need to exude confidence with big, flashy smiles and be seen as determined and bold. We're supposed to be all about team sports and collaborate in hoards. She points out that workplaces now pack their office employees together in shared cubicles or open layouts, removing private spaces necessary for an introvert to recharge and problem shoot alone. Schools, she says, have grouped desks together so that students have to face each other straight on instead of work through math problems and creative writing assignments on their own, as individuals. She argues that American society has failed to see the value of creating quiet getaways for the introverts to do what they do best - which is to make thoughtful, calculated decisions in quiet places - alone. Interestingly, she points out some examples of introverts and extroverts in the workplace and how the introverts' quiet, well-laid plans and ideas are frequently ignored because they are more modest and calm in the presentation of their ideas. She notes that in an office situation where introverts and extroverts are collaborating, the extrovert usually convinces the group to go with their plan and generally succeeds in convincing others simply because they are louder. The introvert sitting on the sideline is frequently ignored because they didn't stand up and do a dance, so to speak, to get people to hear what it is that they are suggesting the group/company do. Cain writes to encourage the extrovert to seek out the quiet introvert's opinion when collaborating and she also writes to encourage the introvert to work on being a little bolder in group environments so that they will be heard. As only a little bit of an aside, Cain also notes that the introvert usually has the better plan because an introvert is more inclined to listen longer, ask questions, think more deeply and calculate risks more than an extrovert would. What is her point in mentioning this? The introvert generally has something to say that's worth hearing. Don't dismiss the quiet sorts just because they are quiet. Their ideas tend to be pretty good. Truthfully I feel a little silly talking about this book because I feel like it's a bit of self-promotion in certain respects. I am the person she describes in this book. I identified with much of what she said regarding the need for quiet getaways to foster creativity and provide rest. I totally understand what she is saying when she argues that to deny an introvert quiet privacy is to risk their health and happiness because if I am on the go for too many hours a day or too many days in a row I begin to physically and emotionally wear out. I have to pace myself or I will literally begin to get sick - sometimes becoming overheated or I'll begin to suffer a sore throat. (I think that aspect is a little weird, actually, but it's truly what happens.) The only way I can recover and avoid becoming really sick is to be at home without anyone outside of our family coming around so that I can just be without feeling like I have to rise to some occasion and make conversation. Perhaps that seems unbelievable but it's true. I did enjoy reading Quiet , mostly because it helps to remind me to pace myself well. And just so you know - I'm writing up my thoughts on this book after returning from a 7-day vacation to see family in which we were constantly on the go. I loved being with my loved ones and cherished every moment I had with them. But at the current moment, I am recharging in a quiet house. My kids are napping, I'm sipping tea, nursing a sore throat, and typing this up while enjoying flannel. I have no desire to leave my house for several days more. Weird? Perhaps. But so true. Extroverts with introvert friends and family that they could better understand if they heard some of this information. Teachers who might learn how to appreciate and make room for the introverted student. Extrovert parents with introvert children who are in any way worried that their child is not equipped to survive in society in its current form. If you would like to get a taste for this book, you might wish to check out Susan Cain's TED talk which has been viewed almost 10 million times. As a fellow introvert (a "friendly" introvert, as I like to call myself), I really need to read this! I have it loaded on my Kindle already; I'm just waiting for the right time. Interesting! I am very, very much an introvert and that also surprises people. I can be very chatty with people I know and feel comfortable with. However, I have to go home afterwards and recharge. I am totally with you on feeling physically sick after being around people for too long. I can feel physically overheated when I haven't had space in too long. I have learned in the past year that it really is better for me if I plan my errands and social activities so that I go out one day and then am home for several. I try very hard to only leave my house several days a week. It makes me sound like a hermit, but I am much more productive on those days I do leave the house if I've had the opportunity to charge up energy first. The section about the workplace makes total sense to me. It also explains why I slept SO MUCH after I was laid off from my job a few years ago. I worked 37.5 hours per week but commuted almost an hour each direction five days a week. When I got laid off, I was surprised at how I started sleeping 10-12 hours per night for the first few months. I was so worn out that it took months to recover my energy. Getting laid off was the best thing that could have happened to me, especially since my husband encouraged me to make homemaking my new "career." She helped me to understand that yes, I am an introvert, though very different from my VERY introverted husband. @Amy & Annette - Yes,I think that's a good phrasing. I like the term "friendly introvert" because, like you both, I like people. I really do. It's just that it takes a lot of energy for me to keep up looking like an extrovert so I have to retreat and recharge. I really like being around introverts who "get" it because they don't assume that I'm "in a mood" when I need to go and retreat. (Extroverts tend to assume the worst when I get quiet and try to find some private space.) I'm not "in a mood." I just need to go some place and wind down so that I can rev up again and keep up with conversation. More and more I notice that if I don't find this space when I'm in a crowd I just start to shut down. And I can't seem to help it but I lose all ability to think up new conversation. However, if I step away for 15-30 minutes I can come back into the group and join in again. As I am currently in the middle of reading this I am going to come back and read your review when I get finished. I'm so glad you finally got to read this. Even though I knew I was an introvert long before they made little tests and quizzes to analyze it, it still helped a a lot in understanding myself and understanding how introverts are perceived by extroverts. I wouldn't have thought that our culture was set up more for extroverts, but after reading this, I can see it now. I'm glad I can be home and manage my interactions (to some degree). I enjoyed reading all the comments, too. I also feel overheated to a degree if I am around people a lot, and can just shut down if I haven't had any quiet time for a while - not on purpose, but I am just drained and can't think of anything else to say. I'm a little over halfway through this book and find it interesting. I admit I think she is biased toward introversion, and I even think her test is somewhat skewed as I scored pretty high with 15-16 trues. However, I really think I am more of an extrovert who needs time away from people after enjoying time with them, and who is impatient with small talk. Nevertheless, I'm enjoying the book and her writing style is very readable. I thought I understood my introversion pretty well before I read this book earlier this year, but I still reference it frequently, even though it's been months since I finished it. My biggest struggle with finding that rest when I need it is that (I'm home with my 2 year old) the noise and activity level, and his lack of understanding of personal space make it where even all of my family home together (or just the 9-5 when I'm mostly home alone with him) isn't that settling feeling, so I struggle to get enough of that time. I need to read this book. It sounds amazing! This is just so weird -- I've always known I'm an introvert, because I like being by myself, I feel that I don't participate in conversation as much as I should... and I do get stressed when submerged in activities or parties too long. But I always thought that was just ME! In fact, I've thought something is wrong with me because I feel these emotions that everyone around me doesn't seem to feel. Thanks for sharing this excellent review! It's funny, I never realized I was an introvert until very recently, because for so many years people told me I was an extrovert. Now, I realize, just because I CAN be friendly in social situations, that doesn't mean I'm comfortable. And just because I talk to you, doesn't mean I'm an extrovert. One way the introversion manifests in me is in the fact that my sleep-in day is never Saturday, but Monday. After a day at church (which I do love and look forward to and am blessed by) I'm exhausted the next day and inevitably end up sleeping 8-10 hours!